Founded in 1896 by Joseph Lodge, Lodge Manufacturing Company is an American manufacturer of cast iron cookware based in South Pittsburg, Tennessee. Lodge has been owned and operated by the Lodge family since its founding, and the family has continued to reinvest in the business for over 100 years to ensure its continued success. of current operations in 1896. The Foundry burned down in 1910 and was rebuilt in its current location. Since the beginning, Lodge has produced and sold cast iron cookware, focusing on skillets but also producing different pieces. In 1896 the catalog included several cast iron items you won’t see anymore such as shoe lasts, sinks, clothing irons, tea kettles, and waffle makers. The teardrop shape of the Lodge Cast Iron skillet has remained largely unchanged since 1896. Lodge has a global presence, selling to 60 countries around the world, as the cast iron category is growing globally. Although the cast iron market is mature, the seasoned cast iron market is a niche market which is experiencing 15% annual growth today. 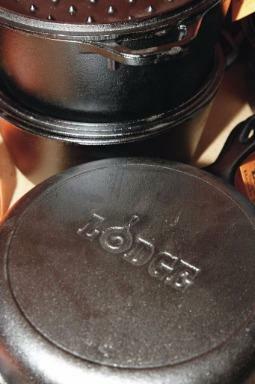 Lodge was the first cast iron manufacture to factory season cast iron cookware in 2002. This was a game-changer for Lodge and for the cast iron industry, saving customers from the need to season cast iron when they purchase it. Modern consumers had fears about pre-seasoning, and this took the worry out of purchasing cast iron products. By fall of 2010, Lodge was experiencing massive growth, beating sales projections by leaps and bounds. From 2013 to 2015, sales increased 90% and production capacity increased 50%. In order to keep up with demand Lodge broke ground on a new foundry last June which will increase capacity by another 75%. This massive growth is organic, Lodge does not advertise to consumers but utilized PR, contracts with 3,000 dealers, and social media to get its message out. Millennials who are new to cooking are attracted to the price and value of cast iron. Another reason for the growth in the seasoned cast iron industry is that many consumers are wary of the chemicals in non-stick products being released at high temperatures. Lodge Cast Iron sells primarily to the kitchen/gourmet market, which has seen an increase in a preference for cast iron over the past 20 years, as well as to the growing restaurant/institution market, and the outdoor market. Mark Kelly, PR Manager at Lodge, believes that it is the versatility of cast iron that has led to the recent growth in sales. Cast iron products can be used throughout the cooking process both to prepare and serve dishes in. Cooks get very creative using cast iron products – serving both warm and cold desserts and appetizers in them. Another draw is that, unlike other products, cast iron skillets can be used in every cooking medium like the stove top, oven, and grill; everything, that is, except for the microwave! We all know not to scrub our cast iron products with harsh detergents and scouring pads, but how do you really care for your cast iron? Kelly personally doesn’t use soap when washing his cast iron skillets, just warm water and a nylon scrubber. While it is perfectly okay to use a little bit of mild soap when necessary, you definitely should NOT put your cast iron products in the dishwasher. Before using a new piece of cast iron, oil the product before use, air dry it on the oven with some more oil after use. You never have to leave behind your skillet. Management at the firm care deeply about good corporate citizenship and about taking care of their environment. Employees live in and enjoy the Tennessee countryside and want to keep it beautiful for generations to come. By its reusable and recyclable nature, cast iron products are environmentally friendly. Lodge Manufacturing recycles the scrap castings of skillets and recycled more the 20,000 tons of aluminum, cardboard, plastic, scrap metal, paper, steel, and cast iron in 2016. To reduce energy consumption, Lodge replaced their cupola melting system to a more energy efficient induction melting system in 1991. As evidence to their commitment to the environment, Lodge received the Tennessee Governor’s Award for Excellence in Hazardous Waste reduction. In order to keep up with the growth in sales, Lodge Manufacturing is about to open a second foundry in South Pittsburg, Tennessee. Even with the major growth the company has enjoyed, Lodge remains a family company and doesn’t plan to change that. Fifth- and fourth- generation owners of Lodge are committed to keeping this 121 year old company in the family, and to continue to invest in the future of South Pittsburg, Tennessee.